Think back to a time when you were a kid with a pile of action figures. Some toys belonged in the same line or universe, while others were from things wholly unrelated to the fiction you wanted to create in your head. Heroes would team up with other heroes they normally would never cross paths with, villains would suddenly become good guys, and you never once questioned the logic of what you were doing because why would you? I bring up action figures because playing with toys is an applicable comparison to the Next Level developed Spider-Man: Friend or Foe because like playing with toys, it’s really best enjoyed by the younger crowd. 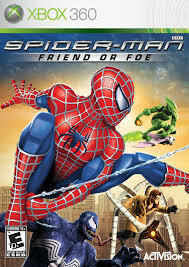 Spider-Man: Friend or Foe, released in the same year as both the Spider-Man 3 film and its tie-in games, is a unique type of Spider-Man movie game. It uses the character designs from the Sam Raimi directed Spider-Man trilogy but puts them in a world where the characters who died, lived, and Harry Osborn has no hang ups fighting the Green Goblin with the knowledge that it’s his father Norman underneath the mask. When Spider-Man is battling his deadliest foes, they’re mysteriously teleported away mid-battle. Nick Fury arrives on scene to explain to Spider-Man that the disappearances are related to a mysterious villain who is using shards from the meteor that brought the Venom symbiote to earth to create creatures known as P.H.A.N.T.O.M.S and is using them to wreak havoc all over the world. Fury enlists Spider-Man due to his experience with symbiotes along with heroes like Black Cat, Iron Fist, and eventually villains from his rogues gallery to bring whoever is behind these creatures and to justice. It’s interesting to look back on the set up for Spider-Man: Friend or Foe and not think about the Ultimate Spider-Man animated series that came a few years later where Spider-Man is recruited as an agent of S.H.I.E.L.D with a group of random heroes as well as villains who were reinterpreted as heroes. Friend or Foe, like Ultimate Spider-Man, is really not meant to be taken seriously with its hit or miss humor, mostly from a talking computer on the S.H.I.E.L.D helicarrier who has a secret crush on Spider-Man, and how it plays fast and loose with decades of established character relationships in the Spider-Man universe. The intended audience won’t mind one bit, and the set up does a good job of putting Spider-Man in the role of a globe-trotting adventurer and explaining why villains like Doc Ock have no problem fighting alongside him. 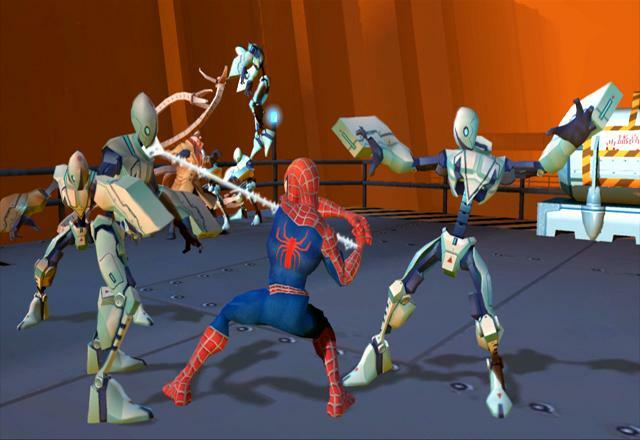 Unlike the last two series of Spider-Man movie titles that were striving to be authentic recreations of the character in the interactive medium, Friend or Foe instead is a co-op beat-em-up, and a pretty boring one at that. If you were hoping for something along the lines of a Maximum Carnage or Separation Anxiety, you’re better off replaying those games instead of playing Spider-Man: Friend or Foe. Because the game takes place outside of Spider-Man’s friendly neighbourhood of New York, instead placing him in locations like Tokyo, a tropical island and Egypt, there’s at least some environmental variety, but no matter where you go, you’ll still just be mindless fighting wave after wave of enemies until you reach the end of the game. The moment-to-moment combat in Friend or Foe has a distinct lack of challenge, even as levels being to introduce things like larger enemies that require you to change-up your tactics. There are collectibles to search for within stages as well as currency that can be used to unlock new moves and power-ups for both Spider-Man and his cast of partners, however even this doesn’t really make things even remotely interesting. It’s hard to really get upset over Friend or Foe as it’s not exactly a bad game, it’s just one that anyone with a two digits in their age won’t get much enjoyment out of unless you’re looking for some easy achievements in the case of the Xbox 360 port or have a friend to suffer through with via co-op. There’s also just nothing that is very Spider-Man-y about this game, really. Yes you play as Spider-Man and fight characters like Doc Ock, Green Goblin, Sandman and Venom, however outside of being able to do a single web swing and some moves that use webbing, this could have been any other character and it would make little to no difference. The same could be said really about the 16-bit Spider-Man beat-em-ups by Acclaim, but at the very least you could stick to walls and in the case of Maximum Carnage, had levels that had you scale walls while avoiding projectiles. I don’t have access to the PS2 version of Spider-Man: Friend or Foe, but can assume that it’s more than likely just the same game as the Xbox 360 game with visuals on par with the Wii version. The Wii version is the same game as the Xbox 360 version, however it replaces some actions with motion controls and is the version that’s the most obnoxious to play. My primary experience is with the Xbox 360 version that looks okay, but won’t exactly wow you with its graphical fidelity. 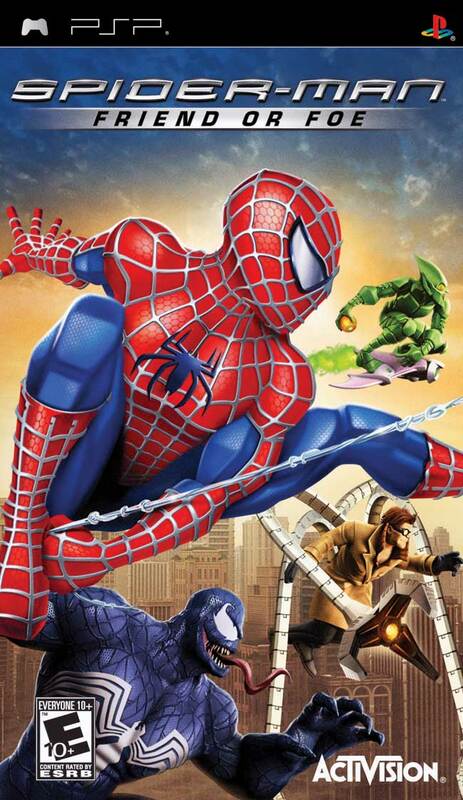 What’s interesting about the PSP version is that instead of simply porting the base game like in the case of Spider-Man 3, it’s a unique game created by the team who did the Nintendo DS game, A2M. It’s more or less the same experience on console, and there’s really not that much to say to warrant giving it a full review. It’s the same type of game with smaller, bite-sized levels better suited to portable play and fairly short overall. That being said, because it’s so boring, it feels like it takes longer to play than what it actually does. 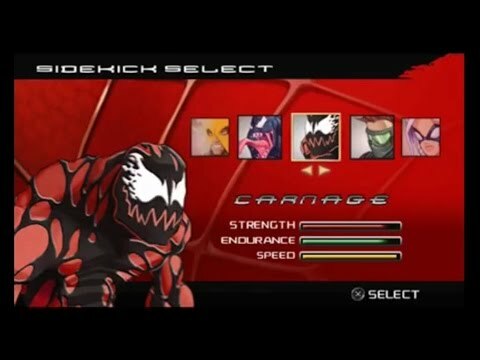 It has a smaller list of unlockable partner characters, though bigger than that of the DS game, but there are two unique characters to the PSP game: Electro and Carnage. If you can find a friend (or foe!) who is down to play a very simple, unchallenging brawler who is at least intrigued by the Spider-Man meets his amazing villains concept cooked up for this game, or perhaps are just looking for some easy achievements, there may be some reason to play thru Spider-Man: Friend or Foe at least once. Only the most dedicated Spider-Man fan above the age of ten should consider playing this game as there’s just so many other better Spider-Man games in which to occupy your time with. There’s nothing offensive about Friend or Foe and it’s not worth getting upset over its existence, it’s just a game that’s satisfied at being what it is: a Spider-Man game for a younger audience who loved the movies.